← “Walking Through The Fire” Socks Pau! I couldn’t post this before because Julie might have read the post. Today, for her birthday, I gave her the “Walking Through the Fire” socks. Julie has been caring for her elderly mom, who is in the middle of the terrible downward spiral of Alzheimer’s. Donna lives with Julie and her husband, and Julie patiently and matter-of-factly answers the same questions over and over and over and over and over and over and over and over and over and over and over again, and sees to it that her mom gets compassionate care every single day. No small job this. Julie is indeed walking through the fire. It’s funny how things end up when you’re not expecting it. I’d originally bought the yarn for myself, because it’s been a “walking through the fire” season for me, too. But halfway down the cuff, ke Akua (God) clearly spoke to me and told me to make them for Julie. I thought that if some small kine way I could let her know that she is not alone on her journey, I would do it. 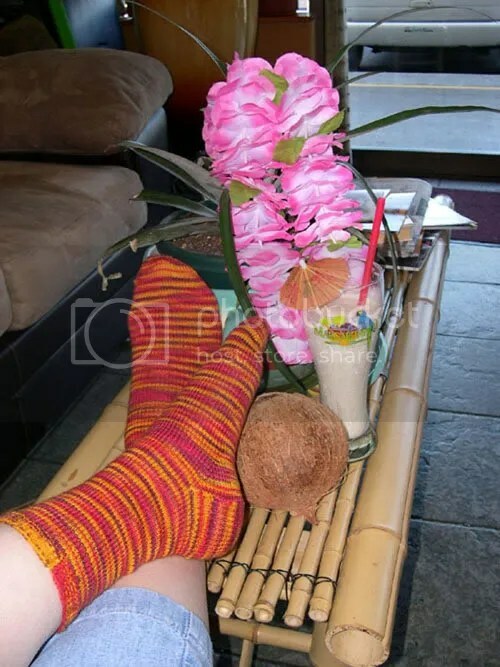 I sneakily found a way to measure her foot (told her that her feet are the same size as my daughter’s… true), and kept knitting away, not keeping the socks a secret. I prayed for her while I knit all of the 28,000 +/- stitches; for endurance, for strength, and for rest. I wanted her to know that I have walked a similar path (with Nolemana’s dad; though he didn’t have Alzheimers, there was still the long goodbye). I wanted her to know that her kindness and compassion towards her mom does not go unnoticed. And that perhaps in some small way, these socks would nurture her the way she nurtures her mom. Julie tried them on at Hawaiian Beanz today. They fit perfectly! 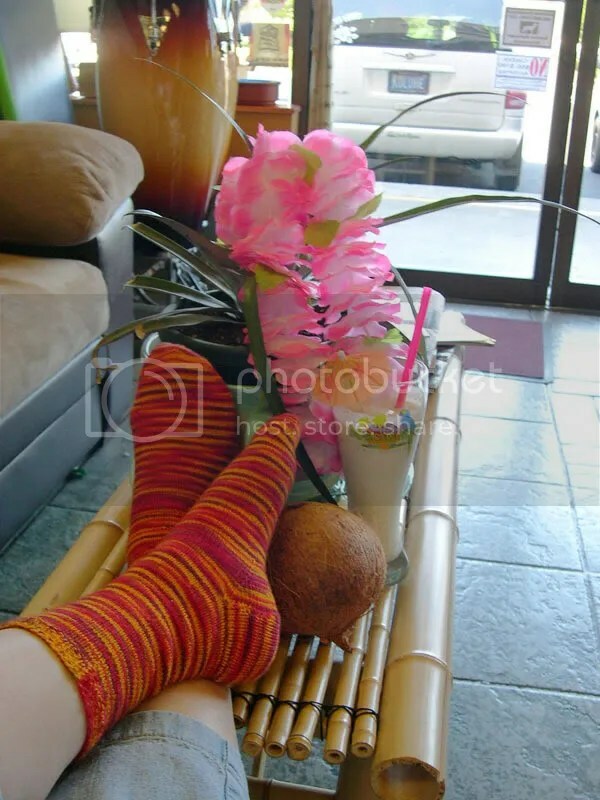 There she is, relaxing with a Pina Colada Smoothie in a nice Hawaiian atmosphere. That’s my car in the background… see my “KOLOHE” license plate? Heh heh. Hau‘oli Lā Hānau e Julie. Me ke aloha pumehana. Way to go Mokihana – I can appreciate your work and your reasoning behind it. The socks are beautiful! What a wonderful friend you are. I’m sure Julie knows now how special she is! Cool present. Looks lava-ish, I tink. Oh yea, count da stitches all da way!! they are most excellent sockies! you have so much talent, but as much as that, you are love itself. I appreciate you bunches, for all that you are. Rock on Julie and Moki. Your kindness(es) make the world a better place. Excellent gift and story of caring. Much Aloha! The socks are beautiful. Your love, your heart and gift to your friend – well that brought tears to my eyes. You are one of a kind and a cherished friend! They’re just plain stockinette socks; the pattern is from Knitting Pure and Simple Women’s Lightweight Socks. I think the sentiment makes them special… Julie is walking through the fire, and the colors of the socks are perfect colors to show that. And her feet don’t get burned, either! Oh I love those socks, Here in Michigan they keep my eyes warm just lookign at them!